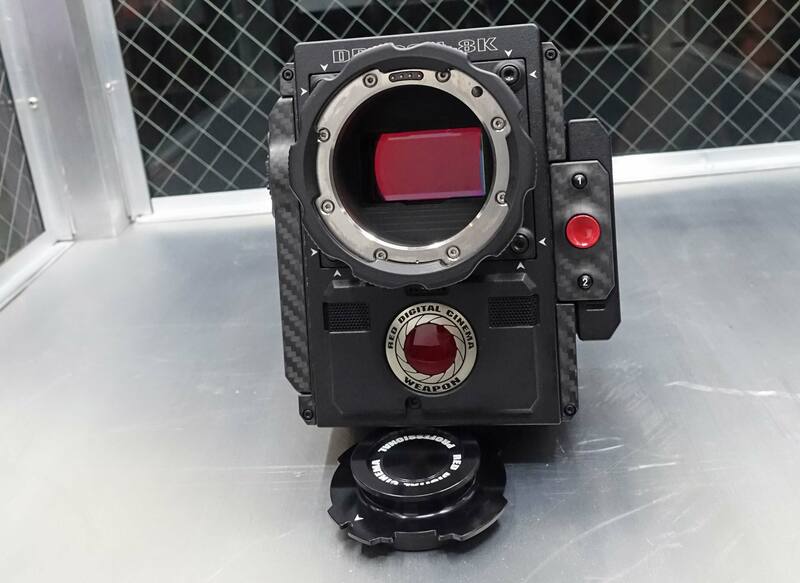 RED’s Weapon 8K, introduced at NAB, is an important new camera expected later this year. There was great good buzz. But there was a lot of noise that missed the point. One pundit wrote “we’re not sure who needs 8K…” Another announced the end of PL. There was panic in some lens booths. The good news is that all current cine lenses will fit, will work, and will remain relevant for a long time. The other good news is that most full frame still lenses will also fit. It’s not so much about the 8K. Yes, it’s an 8K camera, but it will also do 4K in Full Frame and Super 35. What’s important is the sensor size — 21.60 x 40.96 mm. For easy-to-remember math, round down to 20 x 40 mm. That’s about the size of the most popular image format in the history of the world: 24 x 36 mm Full Frame Still, also known as Leica Format, Canon EF, Nikon FX. Hundreds of millions sold. So, the new RED 8K sensor will accept almost every lens and format we know and love right now: Super35 18 x 24 mm, PL mount lenses, anamorphic 18 x 22 full height format, VistaVision, and Full Frame Still. And, oh yes, the entire active RED Weapon 8K 8,192 x 4,320, 35 megapixel sensor if you want to go a few whiskers wider. You will be able to record all these formats in 4K without reduction of image size. Also, you need an 8K sensor to window Super 35 in at least 4K. Jarred sent a diagram, to which I’ve added a few more formats and dimensions. To calculate image circles and diagonals, download the Pythagorean Theorem Solver for iPhone, Or enter Pythagorean Theorem in Google. I guess RED’s reason for the 40.96 mm sensor width also has to do with math. RED Epic Dragon sensors have a 5 micron pixel pitch. If you multiply 5 microns x 8,192 pixels, you get 40.960 mm width. But just because you have that many pixels doesn’t mean you have to record them all in 8K. You can record in 4K — either in REDCODE RAW or ProRes. Super35 24mm wide can be covered with the same math as current Epic Dragon sizes (4.8K) and more with larger image circles. 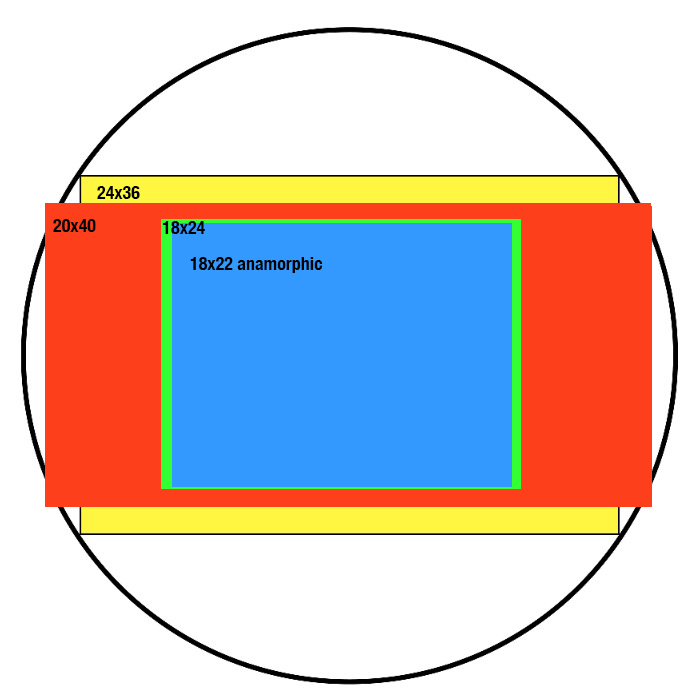 The image diagonal (circle) of Full Frame Still is 43.27 mm, and the image diagonal of 20×40 is 44.72 mm. It’s a whisker’s difference. RED has a big bunch of users shooting fashion photography and video simultaneously, using still camera lenses. 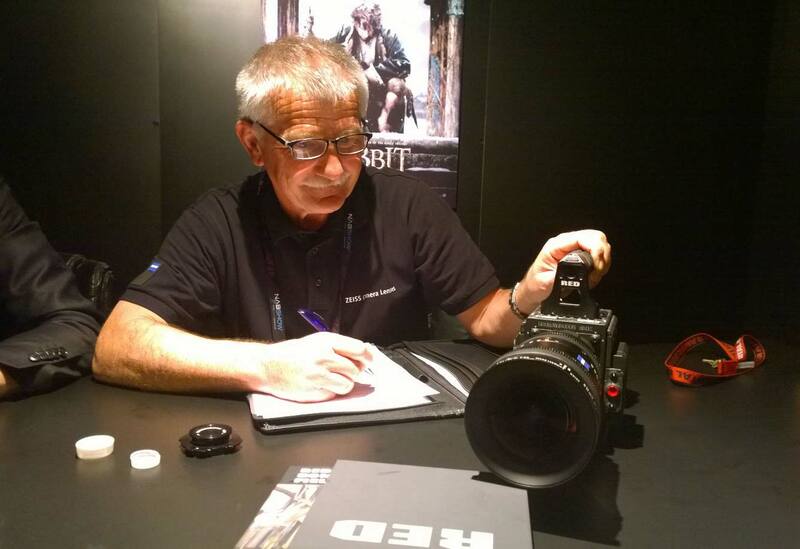 Samuel Renollet of RVZ in Paris has been a big advocate of this, and is looking forward to the new cameras. So is CamTec in LA, and many other rental houses. 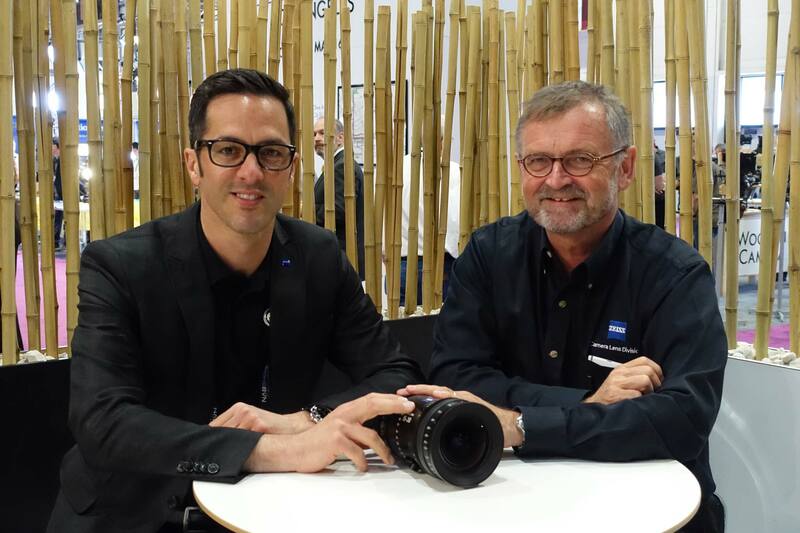 Michael Schiehlen and Dr. Winfried Scherle in the ZEISS booth at NAB. Last Feb 2014 I wrote: “This is the year we will see more 24 x 36 mm sensors from the full frame DSLR world appear in digital motion picture cameras.” Yikes, oops, I was way off with that prediction–a year too early. And RED was the only camera company at NAB to present this. The idea of multiple formats goes back to the beginning of film history. 35mm film was a universal standard for more than a hundred years. But many different formats were available within that standard. All you had to do was put a mask in the gate and change to a different groundglass. In fact, there are so many selectable film formats, they fill a 98-page online Ground Glass and Format Guide from ARRI and a 96-page guide from Clairmont Camera. And not only 35mm. Want a larger format to get people away from their home TVs and back into movie theaters? If it’s 1954 and you’re Douglas Shearer at MGM, Robert Gottschalk, president of Panavision, or Mike Todd, you call Kodak and get a commitment for 65mm and 70mm film negative and prints. Even earlier, 70mm film was used at the Henley Regatta in 1896 and the Paris World Exposition in 1900. Here we are in April 2015, and 35mm digital motion picture cameras have aspect ratios of 4:3 (ARRI Alexas), 16:9 (Sony, Canon, Blackmagic, Nikon, GoPro, Phantom Flex 4K) and 2:1 (RED Dragon). If you are a camera manufacturer, you are delighted if your cameras have sensors 18 mm high—which do not crop the huge selection of new anamorphic 2x lenses now available. 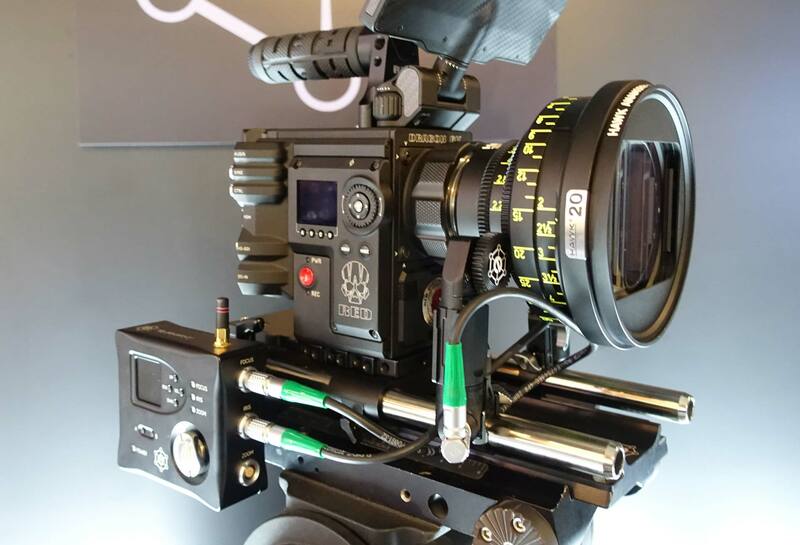 If your digital motion picture cameras are using sensors 13.8 mm or 15 mm high, your customers have probably been beseeching you to provide cameras that will accommodate all these new anamorphic lenses. So, what’s a designer to do? My guess is that the RED designers, rather than try to stretch a mere 3 mm more in height to 18 mm, decided to make the leap directly to even larger sensors, 20 mm high. The most important thing about designing selectable format CMOS sensors, I think, is to accommodate the smallest common denominator. So if you are planning to put 16mm or B4 lenses on your camera, those formats should have at least HD capability. You then do the math up from there. Lest these pronouncements produce dispepsia among the lensmeisters of Leicester, Oberkochen, Wetzlar, Saint-Héand, Saitama, and Morigane, they can take comfort in knowing that 95% of high end features and commercials are using PL or Panavision mount lenses on variations of the Academy format. The new RED Weapon 8K camera will certainly accept all these lenses with its removable PL mount. The big question, and I welcome comments, is whether a new mount and a new standard may emerge. PL mounts have a flange focal depth of 52mm. Panavision PV is 57.15. They were designed for spinning mirror cameras. Mirrorless digital cameras enable shorter flange depths, which enable smaller lenses. Otto Nemenz said, “Give cinematographers a bigger sensor and they will want to fill it up.” The makers of Hawk lenses are smiling: their recently announced Hawk65 Anamorphics were designed from scratch for 65mm digital sensors, and will cover any other format between Super35 – RED 20×40 – Full Frame Still – to 65mm. For R3D there has been no mention of a 4k downsample from 8k from Red publicly. Could this be a typo in your review Jon? Not a typo. But please note that it’s not official gospel either. John! Thanks for that. Just had a lovely discussion on set about this. “give cinematographers a bigger sensor and they will want to fill it up”…. because if they don’t they’ll be vignetting into their own frame! The common response in Hollywood has been how annoying it is to continue to make bigger and bigger sensors that alienate a handful of lenses from being usable. Yes, we can always use a Weapon/Dragon/Epic to shoot at 4K or whatever resolution we want to fit the framing, but there is always a very political battle when it comes to “why are not using the best settings” on any given camera. Of course I’m speaking from the big movie hollywood perspective. It does not output r3d 4k from full sensor but from a quarter crop. It does output 4k prores while recording full frame r3d. But then again recording in r3d full 8k frame does not demand the files to be heavier then lets say 4k as the larger image can take more compression so basically you can record 8k at 4:1 compression an scale down to 4k in post and your material would not be heavier then shooting 4k uncompressed. And a lot of people thinks the r3d format holds up well even at compression ratios are above 10:1… so files does not need to be immensely heavy. In fact they can not be heavier then the 6k version of weapon as the got the same capacity writing speed to SSD. So the only reason to crop in on the weapon sensor is to shoot higher frame rates or simply that you would like a smaller sized format, if your lens does not cover or what ever reson. Shooting smaller format to save data is just dumb you loose lens resolution and you can let the compression do the same saving for you. I think there’s one more addition when you say “the only reason to crop in on the weapon sensor is to shoot higher frame rates or simply that you would like a smaller sized format…” And that is widespread familiarity and availability of so many PL mount Super 35mm sense–spherical and anamorphic–until a lot more full frame cine lenses show up. Which should be very soon. If the Summicron is FF35 as they say – 36x24mm – as they say, then why won’t the shorter lenses cover with a say, 2.40 format?